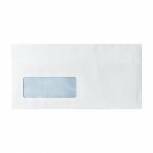 Envelope DL Window 80gsm Self Seal White (Pack of 1000) WX3455 Pack of 1 Plain white envelopes with address window. Crisp 80gsm white paper. Self-adhesive flap. Suitable for A4 documents folded into thirds. DL. Pack of 1000 envelope. 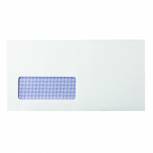 Envelope DL 80gsm Self Seal White (Pack of 1000) WX3454 Pack of 1 Plain white envelopes. Crisp 80gsm white paper. Self-adhesive flap. Suitable for A4 documents folded into thirds. DL. Pack of 1000. Q-Connect DL Envelopes Window Self Seal 80gsm White (Pack of 1000) KF3455 Pack of 1 Q-Connect White Envelopes. 80gsm Banker style envelope with self-seal flap and window. DL 110mmx220mm. 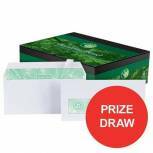 Antelope DL Premium Peel & Seal Envelopes White Plain 100gsm - Box 1000 Pack of 1 High quality everyday envelopes with extra secure seal and a long shelf life. All envelopes in this range are made from white 100gsm envelopes and give a quality look and feel to your everyday correspondence. All common sizes are available to coverall of your everyday business needs. Antelope DL Premium Peel & Seal Envelopes White Window 100gsm - Box 1000 Pack of 1 High quality everyday envelopes with extra secure seal and a long shelf life. All envelopes in this range are made from white 100gsm envelopes and give a quality look and feel to your everyday correspondence. All common sizes are available to coverall of your everyday business needs. 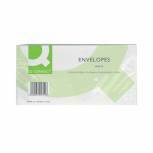 Q-Connect DL Envelopes Plain Wallet Peel and Seal 100gsm White (Pack of 500) 1P04 Pack of 1 Q-Connect DL White Wallet Envelopes Peel and Seal. High quality 100gsm envelopes ideal for business use. 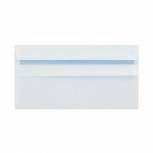 C5 Spey White Wove Envelope 90gsm White Window - Box 500 Pack of 1 Quality white business envelopes with opaque interior. C5 wallet window 90gsm self seal 162 x 229mm. Window Position: 50mm Up, 20mm from left hand side. 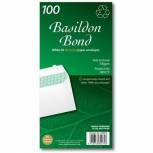 Basildon Bond DL Envelopes Wallet Peel and Seal 100gsm White (Pack of 100) F80275 Pack of 1 Basildon Bond Recycled Peel and Seal Plain Envelopes. Supplied in convenient small packs ideal for use on the move or in the home and office. Size - DL Banker 110 x 220mm. Weight - 100gsm. Colour - White. 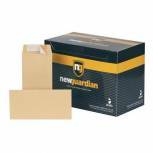 New Guardian DL Envelopes Pocket Peel and Seal Heavyweight 130gsm Manilla (Pack of 500) E26503 Pack of 1 New Guardian Envelope. Heavy duty press seal pocket envelope suitable for mailing important items. Weight - 130gsm. DL 220 x 110mm. 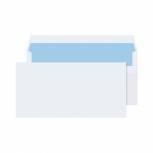 Plus Fabric DL Envelopes Window Wallet Self Seal 120gsm White (Pack of 500) C22570 Pack of 1 Plus Fabric Envelopes. 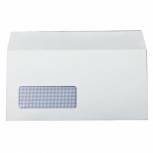 White window envelopes manufactured from 110gsm heavyweight paper with press seal closure and supplied in extra strong boxes to keep the envelopes in pristine condition. Pack of 500. DL - 110x220mm. Q-Connect DL Envelopes Wallet Self Seal 100gsm White (Pack of 1000) 7137 Pack of 1 Q-Connect White Envelopes. 100gsm Banker style envelope with self-seal flap. DL 110mmx220mm. Wallet. Q-Connect DL Envelopes Window Self Seal 100gsm White (Pack of 1000) 7138 Pack of 1 Q-Connect White Envelopes. 100gsm Banker style envelope with self-seal flap and window. DL 110mmx220mm. 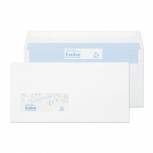 Q-Connect DL Envelopes Window Peel and Seal 100gsm White (Pack of 500) KF03000 Pack of 1 Q-Connect DL White Window Wallet Envelopes Peel and Seal. High quality 100gsm envelopes ideal for business use. Window size 35 x 89mm. 19mm in 18mm up. Evolve DL Envelope Recycled Window Wallet Self Seal 90gsm White (Pack of 1000) RD7884 Pack of 1 Evolve recycled envelopes. 90gsm envelopes with Blue opaque interior showing the recycled logo. These envelopes are made from 100 percent recycled paper and are 100 percent biodegradable. Self seal white window. DL. Plus Fabric DL Envelopes Window Wallet Self Seal 120gsm White (Pack of 250) C23370 Pack of 1 Plus Fabric Envelopes. White window envelopes manufactured from 110gsm heavyweight paper with press-seal flaps and supplied in extra strong boxes to keep the envelopes in pristine condition. DL - 110x220mm. 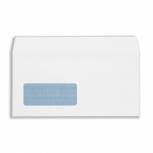 Basildon Bond DL Envelopes Window Wallet Peel and Seal 120gsm White (Pack of 500) A80117 Pack of 1 Basildon Bond Watermarked Envelopes. Add a smart and elegant image to all correspondence. Peel and Seal DL envelopes 110x220mm. Weight - 120gsm. Colour - White. Plus Fabric DL Envelopes Window Wallet Peel and Seal 120gsm White (Pack of 500) B22170 Pack of 1 Plus Fabric Prestige Envelopes. White peel and seal window envelopes manufactured from 110gsm heavyweight paper with peel and seal flaps and supplied in extra strong boxes to keep the envelopes in pristine condition. DL - 110x220mm. 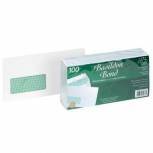 Basildon Bond DL Envelopes Window Wallet Peel and Seal 120gsm White (Pack of 100) D80276 Pack of 1 Basildon Bond Recycled Peel and Seal Window Envelopes. Supplied in convenient small packs ideal for use on the move or in the home and office. Size - DL Banker 110 x 220mm. Weight - 120gsm. Colour - White. 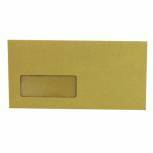 Q-Connect DL Envelopes Wallet Window Gummed 70gsm Manilla (Pack of 1000) KF3423 Pack of 1 Q-Connect Manilla Window Envelopes. Manufactured from 70gsm manilla with a gummed flap. DL 110mmx220mm. 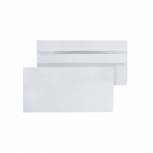 Q-Connect DL Envelopes Plain Wallet Self Seal 80gsm White (Pack of 1000) KF3454 Pack of 1 Q-Connect White Envelopes. 80gsm Banker style envelope with self seal flap. DL 110 x 220mm.